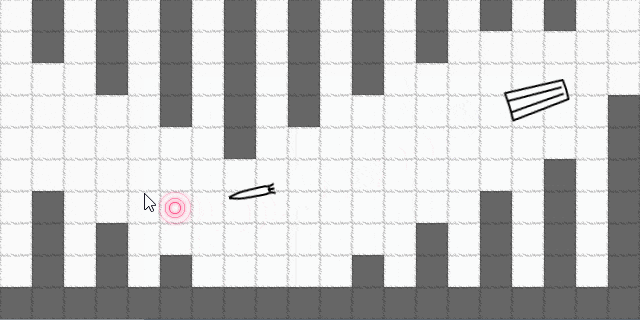 This is a post about implementing homing missiles in GameMaker. A homing missile is a type of missile that can alter its direction mid-flight to hit a (generally) moving target. This example shares much of the concept with "angular rotations explained". Where target is a variable holding the object to track (be that some obj_player or an instance ID), and 3 is rotation speed, in degrees per frame. Add acceleration (speed = min(speed + accel, maxspeed)) and image_angle = direction, if needed. Add obj_launcher, obj_rocket, obj_shard to your source. obj_shard only needed for rocket explosions - if you're going to make your own, you can omit adding that and remove relevant code from "obj_rocket:collision with obj_wall" event). Change occurrences of obj_target in obj_rocket and obj_launcher to name if your desired target object (for most games this is probably your player object). If you have multiple target objects in room, you may need to add target determination code (such as instance_nearest(x, y, obj_player)) there. Tweak parameters (third parameter in angle_rotate calls and speed modifiers in obj_rocket) to suit your game mechanics. Note: this post was originally published on Jun 4, 2013. It was updated on Mar 19, 2017, adding a live demo and important bits of the source code to the post. Is there a way to make this go around walls and such, instead of being destroyed on contact with them? Your safest bet would probably be to use mp_potential_step, which (via mp_potential_settings) similarly rotates the object while following, but will attempt to avoid obstacles. You’ve ended my endless search!! Why 4 days mate? Do you not know gm? Perhaps you should look into the functions instead of CPing code. Copying people’s example is gonna do you know good if you don’t know what you are doing. Hopefully you tried to at least make a homing missle. Anyways, I’m only saying this because it held my younger self back quite a bit in the beginnings of my gamemaker experience. It seems that you have a simple mistake in your demo .gmk file. When a rocket collides with a block, it tries to create “obj_gib”, but in your object resource list, there is no “obj_gib”. Instead there is an object called “obj_shard”, and switching the code from trying to create an instance of “obj_gib” to “obj_shard” resulted in the error being fixed. Otherwise, good example! I believe some may find it useful. Was a post-publication edit because term “gib” doesn’t quite apply to fragments of mechanical objects. Didn’t pay attention to whether I saved last change or not.